Injectors work great took care of my over fueling issue. Will be buy other items for my 6.5 soon from this site. Brand new from SSDiesel, 4" Cat-Back Aluminized exhaust system for all 96 and newer 6.5TD H1 Hummers. After many requests, we now have a system for you! This system is a direct bolt-on for your H1. Dyno tests have proven a 20hp and 35ft/lb gain in power. Please write us for a copy of the dyno sheets. Don't be disappointed by only a 20hp number, reducing restriction as with our exhaust allows the turbo to spool up much faster resulting in more power off the line, when you need it most. Also due to reduced restriction, MPG will also improve. Everything is included from the cat-back for a simple bolt-on install. This is a muffler-less system and makes your H1 sound like the awesome machine it really is. Not offensive or excessively loud at all. Sound clip available on request. Exhaust exits the rear of the vehicle. Please see the photo's below. Will not fit 95 or earlier H1's as they were non-turbo. Made in the USA does not mean just "bent" in the USA, it means we use ONLY American made steel. 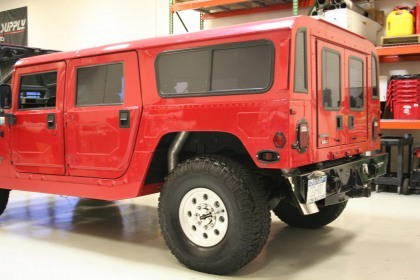 Please compare apples to apples if shopping exhaust for your American made HUMMER. Others selling cheaper use steel made from recycled Chinese soup cans. NOTE: The red Hummer pictured shows the optional 5" x 12" p/n ssd-5051 Polished Stainless Steel tip sold elsewhere on theis website. DANGER WARNING: SHOULD THE PURCHASER DECIDE TO INSTALL THIS, OR ANY OTHER EXHAUST PRODUCT AT HOME, BE WARNED THAT PLEASURE CAR OR LIGHT DUTY TRUCK/VAN "BUMPER JACKS" ARE INTENDED FOR EMERGENCY USE ONLY. THE USE OF FRAME CONTACT JACK STANDS IN CONJUNCTION WITH A FLOOR JACK AS MAIN SUPPORT IS HIGHLY RECOMMENDED TO MINIMIZE ACCIDENTAL DROPPING OF A VEHICLE WHILE THE INSTALLATION PROCEEDS. Limitation of liability--Disclaimers: The regulation of emissions production, noise levels and safety standards is undertaken by the federal government, each of the fifty state legislatures, and by many local municipalities, towns and counties. The manufacturer makes no warranties of merchantability, of fitness for a particular purpose, or that its products are approved for general use, or that its products comply with laws, regulations or ordinances in the states where they may be sold to the ultimate purchaser, the consumer. The entire risk as to the conformity of this product in any such state and as to repair, should the product prove to be defective or non-conforming, is on the retail purchaser, the buyer, the ultimate consumer of such product and it is not upon the seller, distributor, or manufacturer. In this connection, retail purchaser, the buyer, the ultimate consumer assumes the burden of the entire cost of any and all necessary service, alterations, and or repair. The foregoing statement limits the liability of the manufacturer.